Call: Liz Mioni on 0409 596 983. Email: Liz Mioni at aquaworkout@mail.com. 3rd Sunday of the Month - Feb to Nov! 10.45am: Amazing gongs 11 am: Prizes for Best Hat! & Pig Flying Competition! 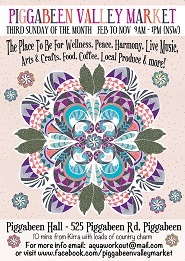 •	Live Music (9am-12.30pm) •	Handmade Arts & Crafts •	Iridology/Naturopathy •	Shiatsu & Aromatouch Massage •	Reiki & Reader •	Tea & Coffee •	Essential Oils & Health foods •	Soundbaths •	GF 'Vietnamese Lotus' Food •	Italian - Manu's Kitchen •	Tea & Coffee •	Home Baked treats •	Local Produce •	Unique gifts •	Bric a Brac BYO picnic rug or chairs, relax & enjoy the music while you brunch, lunch or shop! A great variety of fantastic stalls awaits! Enjoy our lovely friendly country atmosphere! For more information contact Liz at aquaworkout@mail.com or find us on facebook at www.facebook.com/PiggabeenValleyMarket.